BlackwaterBLUE from monkster.com: What can we expect from Raul Meireles? What can we expect from Raul Meireles? It may well be that Raul Meireles turns out to be an excellent signing for Chelsea as he provides further depth for a midfield that has been struggling for options in recent years. Now that he is officially part of the squad, what can we expect from Meireles as he works his way on to Andre Villas-Boas’ team sheet? 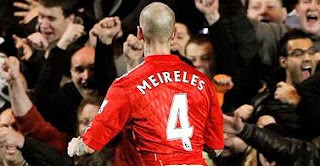 Meireles is flexible: he has the potential to play any number of roles; from advanced, attacking midfield positions to an out-and-out defensive role and is a decent finisher. Most of his goals come by either trailing into the box late, or by taking pot shots from the top of the box - not unlike Frank Lampard. He scored five goals in 45 appearances for Liverpool, but the goals he scored were vitally important for his club. Most notably, against the Blues last February. His role on the squad is not so much to score goals as it is to put pressure on the ball, to link up the defense with the attackers, and to show some defensive nous. Meireles may come to Chelsea and start immediately, especially as he has an injury and given the form of Ramires. The most important immediate contribution is likely to be cover for injury in any number of positions on the pitch. For Liverpool, he occasionally started as a center-forward when Kenny Dalglish faced injuries. Meireles can even play wide if necessary, as he possesses the pace and service to make for a quality right-sided midfielder. When we combine this flexibility with the injury problems Chelsea faced last season in the middle of the park, it is no wonder that Chelsea decided to complete the signing of Raul Meireles. Meireles is not especially young, at 28 years old. Given the glut of young players coming into Chelsea lately, however, this may not be a bad sign for the Chelsea squad. Meireles is not coming in as a signing for the future, but rather as a signing for the present. He will serve as a great addition in Chelsea’s transition from the "old guard" to the youth movement in the coming years. Whether he can become a regular first-team player or remain on the fringes of the first-team squad remains to be seen. What Chelsea fans can expect for sure is a gritty, dedicated performance from Meireles every time he sets foot on the pitch. That is something that any fan can appreciate, and it is something that Chelsea will welcome into the squad in the coming weeks.